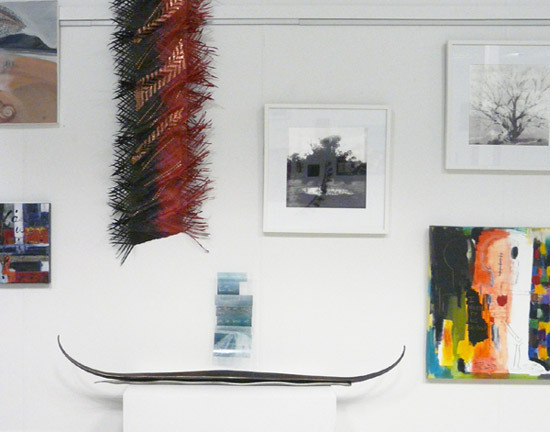 10 April – 1 June 2015 Top Left to Right: Detail of Wairua 2, oil paint/mixed media on canvas, by Keri Molly; Homage, oil on canvas, by Lynn Pirrie Smith; Pou Wairua woven flax + copper panel by Jess Paraone; Several Seas, photographic print on transparency by Sen McGlinn; Long Boat, mild steel by Peter Brammer; Puddle, Pigment print on cotton rag by Lisa Clunie; I want to be reborn, acrylic & oil stick on canvas by Simon Kerr; Prana, Pigment print on cotton rag by Lisa Clunie. Whenua refers to the link between us and life or the life spirit, which sometimes refers to the land or the natural world. 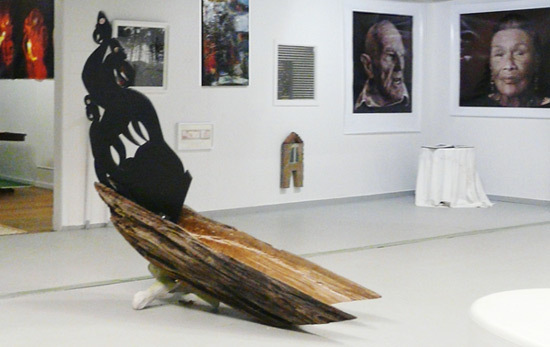 Curated by Piripi Ball + Laurell Pratt this exhibition theme of the spirit as the power of humanity and the power of the natural is expressed in sculpture, carving, weaving, paintings, photographic, installations and craft and design. Piripi’s remit for this show was to encourage artists to approach this theme from the materiality as much as from an abstracted stance and he was successful in getting work from a huge diversity of artistic approaches. 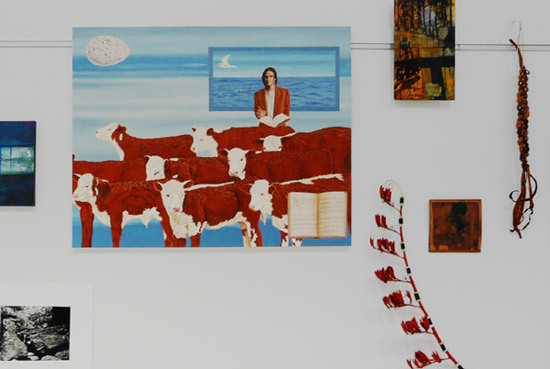 Left to Right: Tewhate-wha – Taonga tuku iho aa Tawhaki / Jeweled Heirloom of Tawhaki, maire, deer antler by Te Kuiti Stewart; Tiki-wananga – Matauranga Aariki / Knowledge of Progenies, kauri, koa, silko, feathers, paua by Te Kuiti Stewart; Where Two Waters Meet, acrylic & gesso on canvas, by Bev Wilson; Detail of a photograph by John McMullen. 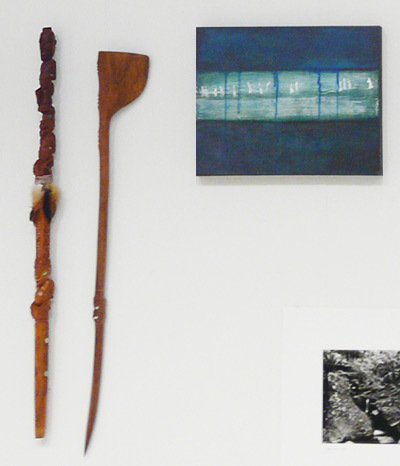 Left to Right: Detail: Where Two Waters Meet, acrylic & gesso on canvas, by Bev Wilson; Mauri, silver gelatin print by John McMullen; Rosary, oil on canvas by Hugh Major; Passion 3, mixed media on board by Brenda Liddiard; Koraro Totem, flax flower heads, pumice, copper wire by Carolyn Lye; Howling in the Night, plywood, indian	ink, wire by Natascha Rodenburg; Four Strands, plaited bull kelp with harakeke tie by Carolyn Lye. Left to Right: Round Pit fired pot, stoneware thrown pot, pit fired with wooden horn handle by Julie Cromwell; Untitled (Solar Flare), pigment print on cotton rag by Lisa Clunie; For the love of Stars, feather crosses by Alicia Courtney; Journey Home, screenprint by David Knight; Birdman Series, acrylics/spray paint on wood by Leonard Murupaenga; Pit fired Pot Thrown, stoneware pot, pit fired, copper wire around horn handle by Julie Cromwell; Early Tides – Rawene, silver gelatin print by John McCullum; Hidden, carved oak, sooty	mould (fungi), cooper wire, wood, glue, ink by Natascha Rodenburg; Jerusalem Window 1V, mixed media on canvas by Brenda Liddard; Waka, wood-fired, ceramic sculpture by Dorothy Waetford. Open Wed-Sundays: 10-4. Their facebook page.